Mr Zuckerberg said he opened up his page on purpose. Facebook founder Mark Zuckerberg has changed the privacy settings on his personal page to open it up to friends of friends. This means that hundreds of his photographs and status updates are now visible to a very wide audience. 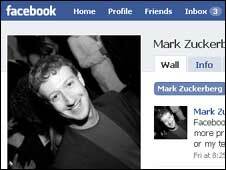 Before the switch, only minimal information about Mr Zuckerberg was available via Facebook. The change comes as Facebook faces criticism for big changes to the way members manage their use of the site. On 9 December Facebook announced the changes to privacy settings via a pop-up message that greeted all members when they visited the site. Facebook has faced criticism over the changes because, broadly, they increase the number of people that will be able to view the information an individual puts on the site. Some groups have been formed to channel disquiet about the changes to Facebook managers. The social networking site was criticised for making some information available to all with no chance to limit who can see it. The adverse reaction to the privacy switch has forced Facebook to roll back some changes. In particular, it has stopped making lists of friends available to all. Blogger Kashmir Hill from True/Slant discovered the change to Mr Zuckerberg's status which means friends of his friends can see about 300 of his previously private photos and see many more of his status updates. It reveals, among other things, that Mr Zuckerberg is a fan of Taylor Swift and attended a Great Goat Roast in the autumn. Initially, Ms Hill believed the change was accidental and Mr Zuckerberg had fallen foul of the complicated rules governing what information is shared and what is public. But in an update to his personal page Mr Zuckerberg said opening up access was deliberate. Writing on the page, he said: "For those wondering, I set most of my content on my personal Facebook page to be open so people could see it." He added: "I set some of my content to be more private, but I didn't see a need to limit visibility of pics with my friends, family or my teddy bear :)."